What is Disc Bulge and Disc Herniation? Your spine is made up of 24 articulating vertebrae and in between each of these vertebrae are intervertebral discs designed to stop the vertebrae from rubbing together and give them cushioned support. When you develop a problem with these discs such as a disc bulge or herniation, it is considered a more serious back problem. This occurs when a part of the disc bulges outside of the line of the vertebrae and impinges on a nerve causing pain and weakness in the lower body. A person with weak muscles around their lower back and core are more likely to end up with a disc problem. It is also common in people who have muscle imbalances that cause their pelvis to tilt or rotate. Poor muscle condition and maintenance in active people will often lead them to developing a disc problem because of the pressure being placed on the spine when it should be being carried by the muscles. The structure around the vertebrae and disc is fairly compact and there is not a lot of room for error before a nerve or the spinal cord is being irritated by a section of the disc that has bulged to the side. If a person has strong and balanced muscles around the spine and pelvis they will be much less likely to develop a disc bulge or herniation and are more likely to recover quickly from any strain that they get to their back. The level of the pain experienced when there is a disc problem can be what makes it an urgent problem to fix and a sufferer will opt for surgery in order to get fast relief. This level of pain and the poor success rate achieved by most conservative treatments on a disc problem often lead a person to take the surgery road even when they would prefer not to. When a disc bulge or herniation is not treated properly it can worsen and end up in a complete rupture where the annulus or outer casing of the disc tears and the fluid inside the disc leaks out. When this happens surgery is often prescribed and this can be the start of future problems with the spine that require ongoing treatment and a curtailing of activities. One of the most difficult things when it comes to a disc injury is finding a therapist who has the skills necessary to fix muscle imbalances in the body and take the pressure off the spine and disc. The usually prescribed treatment is stretching and exercise in combination with massage, drugs or steroid injections. When relief does come through these methods it usually means the cause of the disc problem has been buried into the body’s muscle system and one day in the future it will resurface and the pain will come back. Sadly these approaches don’t change what is going wrong with the muscles causing pressure on the spine and disc, and more often than not, they end up irritating a disc bulge rather than fixing it. It doesn’t take much extra irritation to wear down a sufferers patience and get them to agree to surgery that they are led to believe is a ‘quick fix’. In many cases it is possible to get complete pain relief for a disc/ nerve pain using conservative treatment from a skilled therapist. But unfortunately it is largely a lost art and very few therapists have the knowledge and skills to deliver relief in this way. My best advice when seeking relief for a disc bulge or herniation is only consider treatments that look at the mechanics and alignment of the FULL body, rather than those that focus on just the disc and surrounding area. Everything is connected and most times where someone feels pain is NOT where the problem lies. Hands on treatment on the muscles is the one most likely to provide relief but as nerves are involved, be sure to seek out a therapist who has many years of experience with this problem. 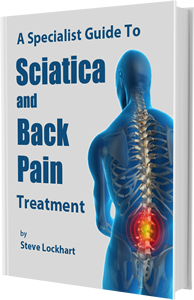 For more understanding of a disc bulge or herniation, and the body in general, when it come to pain and how to fix it, why not download a free copy of my book at the bottom of this page. Please note: Results are not typical and may vary depending on the effort and time they are done and also on a person’s age, condition and general health. People who carry out the exercises and follow the advice on this site do so at their own risk and those with existing health conditions should always consult their Doctor before they undertake the exercises in the programs or videos contained on this site.